We are super excited to welcome back Nitrous Oxide & Mysterious Movement to the label with their new single 'El Camino'. After the duo's previous outing 'Breathe' picked up major support from the trance family and stormed its way up the trance charts, the guys are back for round #2. With the success of 'Breathe' still sending shock waves around the globe, Ntrous Oxide & Mysterious Movement have once again kicked it up a notch and 'El Camino' is another lush trance journey. Packed with yet another emotive melody, rolling groove and bags of energy, this dynamic duo sure know how to craft those timeless trance moments - huge! It's an all out Polish 1-on-1 for our next release on Mondo. Trance guru Nitrous Oxide and rising star Mysterious Movement team up to bring you "The Journey". 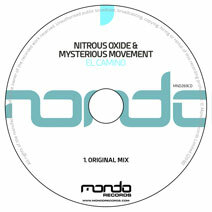 Nitrous Oxi..
After creating waves with their Mondo Records debut single ‘The Journey’ back in 2010, we are pleased to welcome back Nitrous Oxide & Mysterious Movement with their latest tran..